The number of Yale-NUS College students declaring as science majors has increased, according to a breakdown of major declarations obtained by The Octant. Mathematical, Computational and Statistical Sciences (MCS) replaced Philosophy, Politics and Economics (PPE) as the most subscribed major for the class of 2019. The data includes results for the classes of 2017, 2018 and 2019, the last of whom declared their majors on March 17. 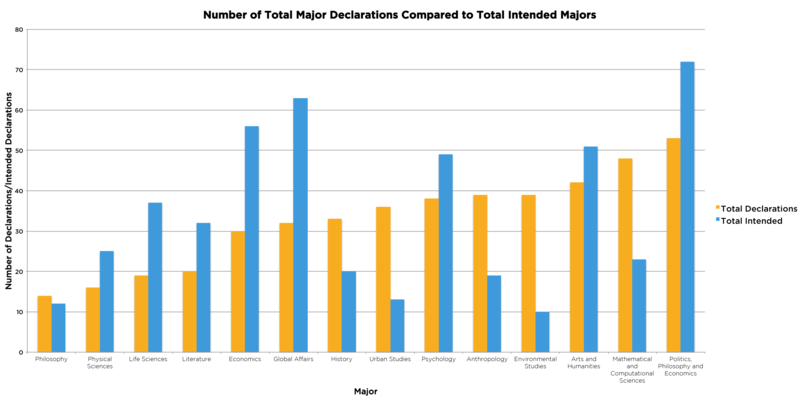 This dataset only reflects the number of declarations, so may not reflect students changing majors after declarations. The results show trends in individual majors. PPE remains the most subscribed major, but saw a drop in the number of declarations for the class of 2019 of 40%. MCS replaced PPE as the most popular major for the class of 2019, seeing a 57% increase in the number of declarations. There was also a consistent increase in the proportion of students declaring science majors—up to 21% for the class of 2019. Social science remained the most popular discipline, accounting for more than 44% of declarations for all classes. The Octant also obtained data on the majors students intended to take prior to joining Yale-NUS. However, the data shows different trends when compared to the number of declarations. PPE was the most popular intended major for the class of 2019, with three times the interest of MCS. 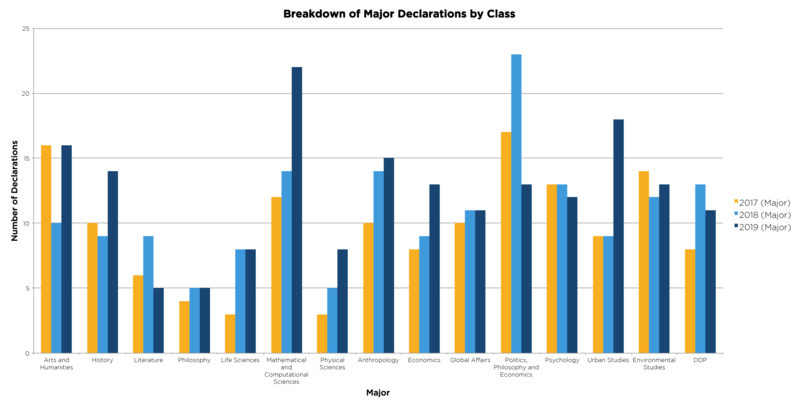 A breakdown of Yale-NUS major declarations by class. Those interviewed by The Octant suggested a number of reasons for the changes, including increased awareness of science and a change in PPE requirements. It is also possible that the variations in major declarations are the result of random differences in the composition of each class—especially given Yale-NUS’s small class sizes. One explanation for the increase in science majors is a change in how science majors are viewed. Division Director of Science, Mark Bussell, said that it might have taken some time for students to realize that a liberal arts college is a good place to be a science major, like in the United States. The admissions office and faculty have been making an effort to get out the word that liberal arts education means liberal arts and sciences, according to Dean of Faculty Steven Bernasek. While he hasn’t talked to them directly, Mr. Bussell said he sensed that they were putting more effort into attracting students who want to be science majors. He added that science faculty had been heavily involved in past Experience Yale-NUS Weekends, when prospective students get a first taste of the college. Still, science has seen only a comparatively modest increase in students intending to major in the division when joining the college. There was an increase of 50% in the number of students intending to major in a science subject compared to a 111% increase in the number of declarations in the same time period. Yale-NUS major breakdown by class. Another explanation is the improvement in science resources. Both Mr. Bernasek and Mr. Bussell said the new teaching laboratories, equipment and research spaces may have had an effect on declarations. Mr. Bussell also said that the College had hired really good science and MCS faculty and that the word was getting out to students. Looking to the future, Mr. Bussell expects the number of science declarations to continue to rise. “I think this upward trajectory is likely to continue and I’m pretty excited by that,” he said. In the long run, Mr. Bussell would like to see science majors account for over 30% of majors. As for the decrease in PPE major declarations, Head of Studies for PPE, John Driffill said that one reason may be the change in major requirements. For the class of 2019 onwards, PPE students will have to do four courses in one subject area, three in a second, and two in the third. Within those are further requirements, which include requiring all students to take either Econometrics or Methods in Social Sciences. These sentiments were echoed by students. Tamara Burgos Rojas ’18, a former PPE major, switched to Global Affairs major with a minor in Economics, because she was mainly interested in politics and economics. “I felt like the structure didn’t allow me to take as many courses in economics and politics as I would have liked,” she said. Other students cited personal reasons for not choosing PPE. Francesca Maviglia ’19 said it was difficult to choose between Anthropology and PPE because the topics she was interested in were relevant to both disciplines. She ultimately chose Anthropology because, in her opinion, “an anthropological approach […] is the most complete.” However, she says she may still switch majors before graduation. Mr. Bernasek said he didn’t have any firm ideas about the drop in PPE declarations. Mr. Driffill said that the fall in the number of PPE declarations was not a matter for concern. He said that the high number last year was more concerning and this year “the balance across majors looks better.” PPE was the joint-sixth most popular major for the class of 2019 with 13 declarations, slightly above the 12 declaration average. Arts and humanities was the second most popular major for the class of 2017, with 16 students (12% of the class) choosing it. It then fell to just 10 students (7%) for the class of 2018, before rising again to 16 students (9%) for the class of 2019. History received a moderate boost in declarations for the class of 2019. The number of declarations increased to 14 students (8%), up from 9 and 10 for the class of 2018 (5%) and 2017 (7%) respectively. Literature saw a drop in declarations for the class of 2019, after an increase for the class of 2018. Originally, 6 students from the class of 2017 (4%) declared as Literature majors. This increased to 9 for the class of 2018 (5%) but fell to 5 for the class of 2019 (3%). Literature was the least declared major for the class of 2019, along with Philosophy. Philosophy has the fewest declarations of any major. Only 4 people from the class 2017 (3%), 5 from the class of 2018 (3%) and 2019 (3%) declared philosophy as their major. 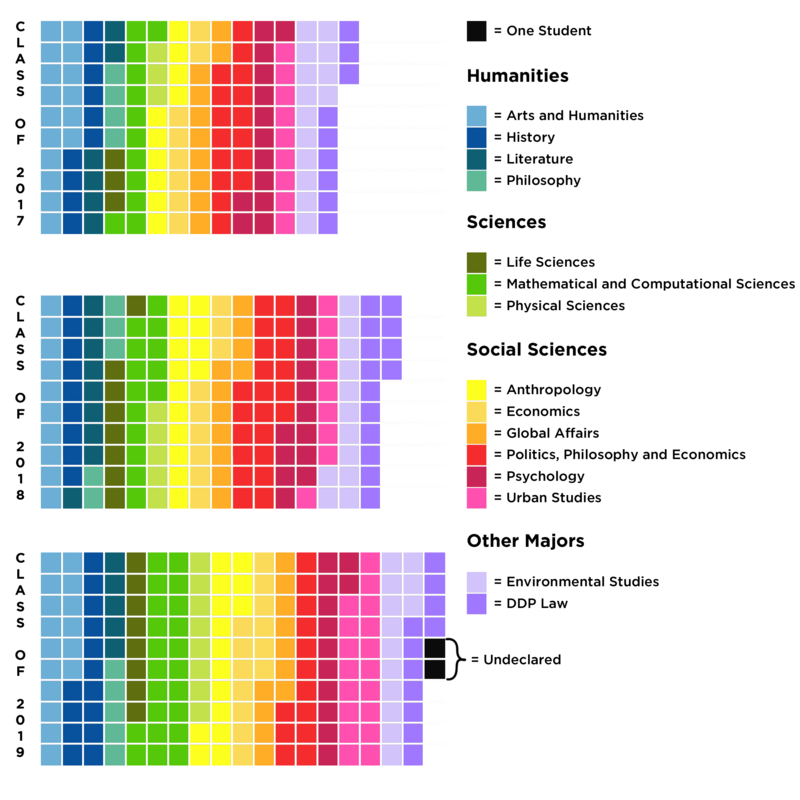 This placed Philosophy as one of the three least declared majors for each class. Philosophy had the second most unpopular major among students joining the college, according to the data on intended majors. Life Sciences has seen a moderate increase in popularity. It was the least popular major for the Class of 2017, along with Physical Science, both with 3 declarations (2%). It’s popularity has since increased with 8 declarations by both the class of 2018 (5%) and 2019 (4%). More students indicated taking Life Sciences when joining the college than actually declared. MCS declarations rose substantially to become the most popular major for the Class of 2019. MCS was the fifth most popular major for the class of 2017, with 12 declarations (8%). It then became the joint second most popular with 14 declarations for the class of 2018 (9%). Finally, 22 students declared for the class of 2019 (12%). Physical Science has seen a steady increase. The number of declarations rose from 3 for the class of 2017 (2%), to 5 for the class of 2018 (3%) and finally 8 for the class of 2019 (4%). Anthropology remains one of the more popular majors in Yale-NUS. The number of students declaring anthropology has consistently risen, from 10 in the class of 2017 (7%), to 14 for the class of 2018 (9%) and to 15 for the class of 2019 (8%). Economics, too, has slowly risen. Eight student declared for the class of 2017 (6%), nine declared for the class of 2018 (5%) and thirteen declared for the class of 2019 (7%). Economics was the third most popular intended major for students joining the college. Economics was the major with the third most intended declarations among students joining the college. Global Affairs declarations have remained stable across classes in absolute terms. For the class of 2017, 10 students declared as Global Affairs majors (7%). This then rose to 11 students for both the class of 2018 (7%) and the class of 2019 (6%). It has seen a slight decrease as a proportion of major declarations. Global Affairs was one of the most popular intended majors, with approximately twice as many students intending to major in the subject than declaring. Originally the most popular major, PPE saw a sizeable drop in declarations for the class of 2019. For the class of 2017, 17 students declared PPE as their major (11%). This then rose to 23 students for the class of 2018 (14%). However, the number of declarations fell to 13 for the class of 2019 (7%). PPE was the most popular intended major among students joining the college, with 27 students indicating it as their intended major from the class of 2019 alone. Psychology, too, has seen stable declarations in absolute numbers, with a slight decrease as a proportion of majors per class. Thirteen students declared as Psychology majors from both the class of 2017 (9%) and 2018 (8%). For the class of 2019, 12 students declared as Psychology majors (7%). Urban Studies saw a dramatic increase in the number of declarations for the class of 2019. Nine students declared as Urban Studies majors for both the class of 2017 (6%) and 2018 (5%). However, this doubled for the class of 2019, with 18 students declaring as Urban Studies majors (10%). This made it the second most popular major for the class of 2019. Environmental studies is the fifth most popular major, despite being the least most popular intended major among the classes when joining the college. Declarations have remained relatively stable, alternating between 12 and 14 students declaring per batch. However, as a proportion of each class size, environmental studies has fallen slightly. It was the third most popular major for the class of 2017 (with 9% declared), but fell to the eighth most popular for the class of 2018 (with 7% declared). Environmental Studies is not categorized into any of the three divisions (Humanities, Social Science or Science). DDP enrollment has remained relatively stable between classes. Initially, 8 students enrolled for the class of 2017 (6%). There was then an increase to 13 students for the class of 2018 (8%), before a slight drop to 11 students for the class of 2019 (6%).